Hair treatments like dyeing, perming and straightening are typically reserved for women who are not pregnant. In recent years, hair dyes have shown no effect on the fetus and are thus considered safe for use during pregnancy as long as the dye does not come in contact with the scalp for extended periods of time. Faster processing times, such as 10-minute home dyes, provide an even better solution for changing the look of hair while pregnant. Perming, on the other hand, requires longer processing time and thus a greater risk of chemical absorption through the scalp. Chemicals used during the perming process can be absorbed into the bloodstream and thus come in contact with the fetus. Pregnancy hormones also make perming while pregnant a bad idea. Hormones can change the way hair reacts to perming chemicals. Even if the perm is supposed to leave a pregnant woman with long, flowing spiral curls, she may end up with frizzy locks. The same threat comes with hair dyeing, as the color may not turn out as intended. Experts have noted there is no clinical proof that perming can harm the fetus, but sufficient testing and data is not available to back up these claims. Most pregnant women claim the strong scent given off during the perming process causes migraines and nausea. These effects can be attributed to an increased sense of smell during pregnancy. Obstetricians advise patients to stay away from lye based hair treatments. If the perming process includes the use of lye, the treatment should be reserved for after pregnancy. 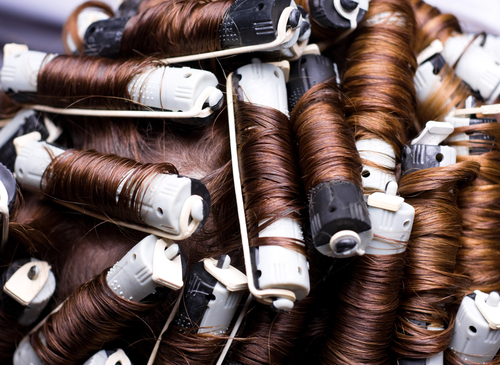 The most common negative effect of perming while pregnant is trouble with the perm “taking”. Many women report perms lasting only a few weeks, which adds up to more time spent in contact with chemical perming solutions and an increased risk to the fetus if there is a negative effect associated with perming during pregnancy.